We love outdoor spaces around these parts. Intimate outdoor gatherings, morning swims, and barbecues, are just some of our favorite outdoor things. 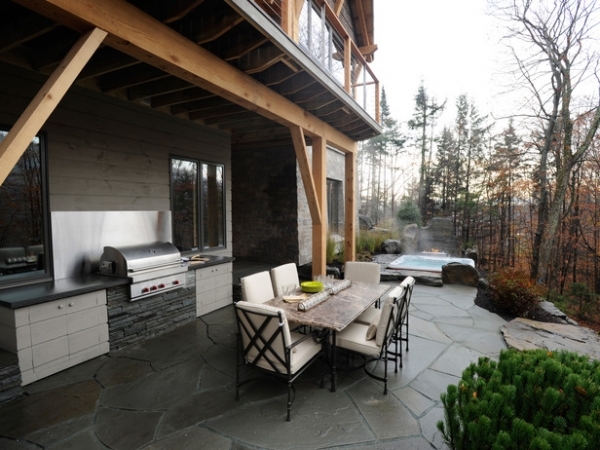 Therefore, it’s no surprise that we enjoy thinking about and drooling over outdoor kitchens, and we hope you do too. So, without further ado, here are some gorgeous ones. Fantastic stone, contemporary chairs, and a marble table, create a large amount of elegance in this wonderful space. 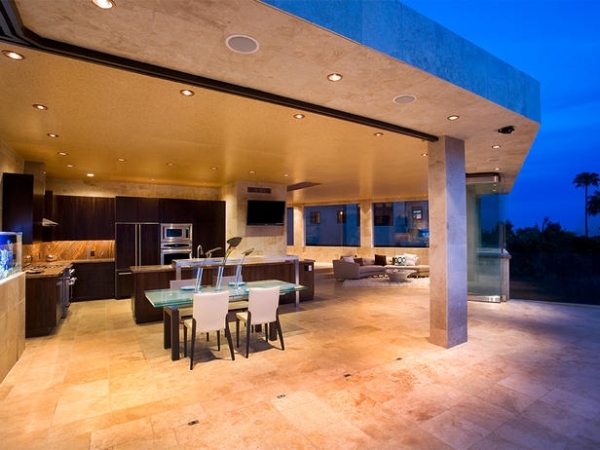 We love the patterns surrounding the large grill, and of course, that fabulous hot tub. 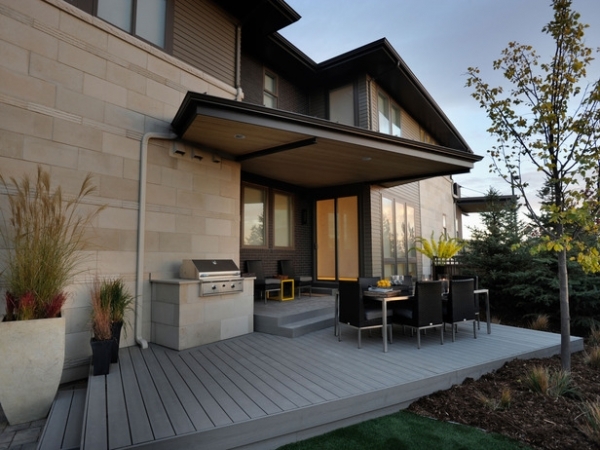 Outdoor kitchens are always fantastic when they are functional and beautiful. Nestled in a nook, this kitchen can be hidden at a moments notice. The bright red chairs are a nice touch, adding color, and seating, for those who love to gather around the grill (and critique the cook). This setting is absolutely gorgeous. It is cozy and bright. 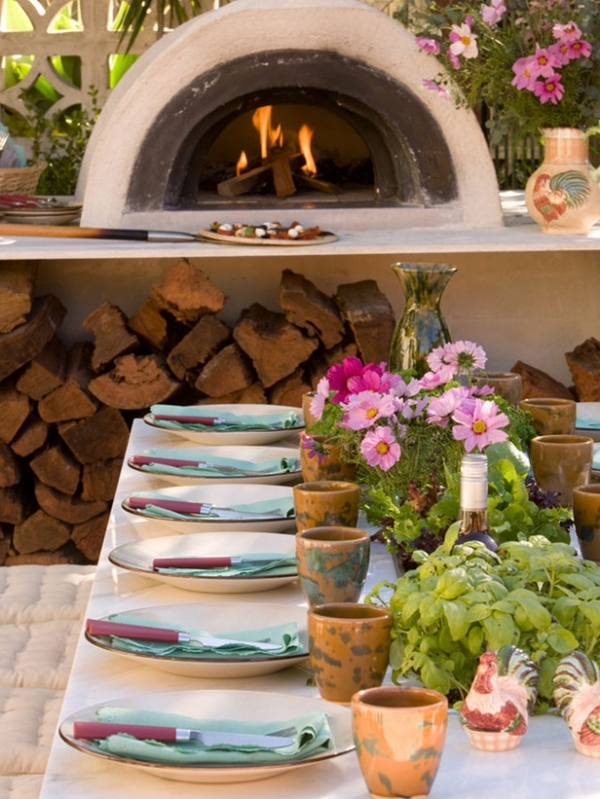 A wood-fired pizza oven is always a plus. The color combination of this outdoor kitchen is soothing and relaxing, it creates the perfect atmosphere for intimate dinners. Talk about a retreat in your backyard. 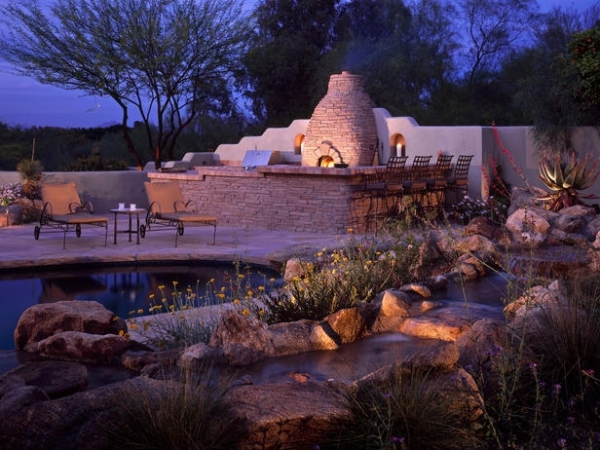 The stone, the bar seating, the water, the rocks, the flowers, all create a one of a kind outdoor space. 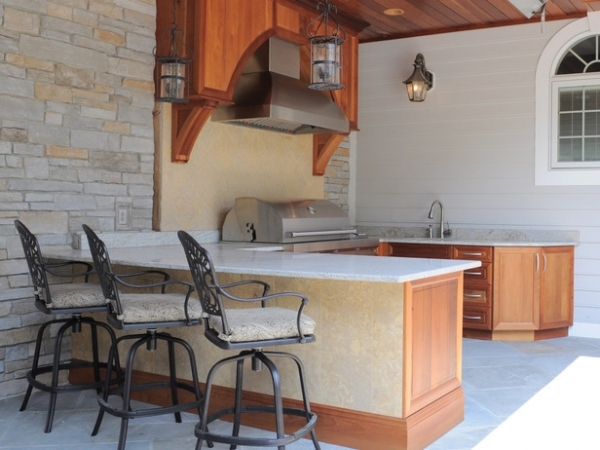 We love the wood in this outdoor kitchen. The covering is also fantastic, it protects the entire kitchen from the sun and the elements, allowing for a barbecue in any weather condition. 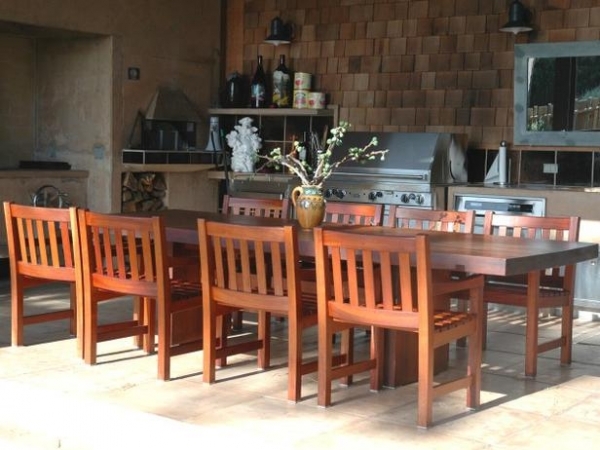 This space has Oklahoma flagstone, cedar, and stacked stone. The rough edges of the countertops are really beautiful. 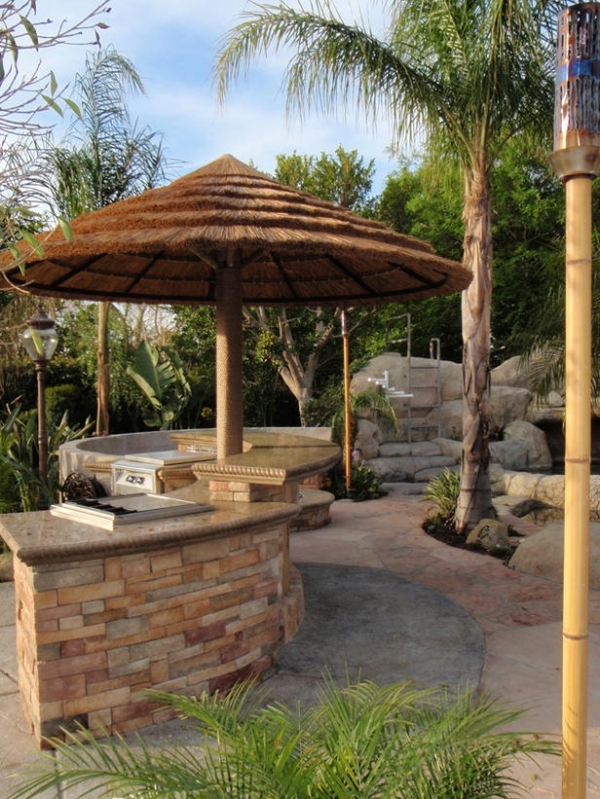 The tiki and the bountiful vegetation adds a tropical feel to this outdoor kitchen. The curved islands, add even more interest to this fantastic space. Oh yes, the indoor/outdoor experience. We adore this gorgeous space. 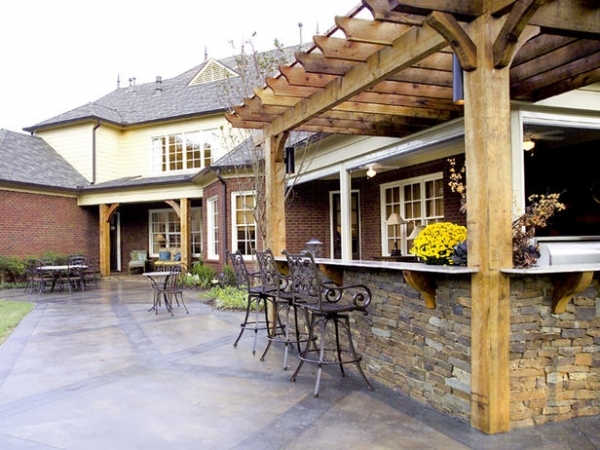 By definition it’s not an outdoor kitchen, but it does provide a similar experience, and it’s equally perfect for a huge celebration and dinner on Tuesday. 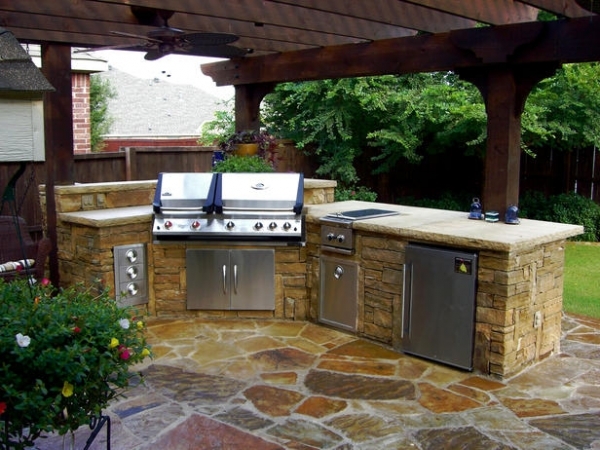 Outdoor kitchens are not limited to one or two cooking devices. This one has a rotisserie grill, a pizza oven, a large grill, and a convection oven. 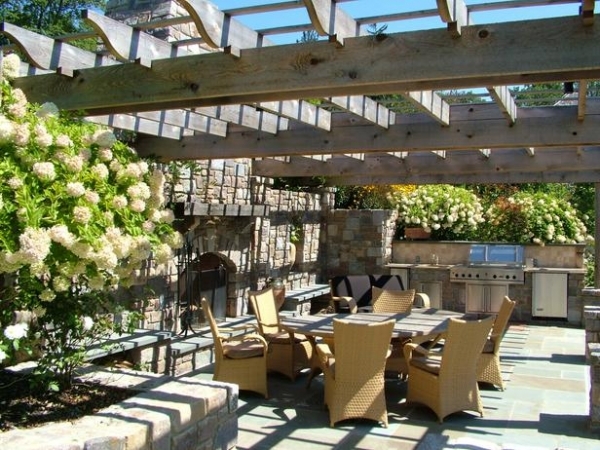 The gorgeous flowers, the stone, and the natural wood pergola, combine to create an enchanting atmosphere. The intricate bar seating is absolutely stunning. And that’s it. 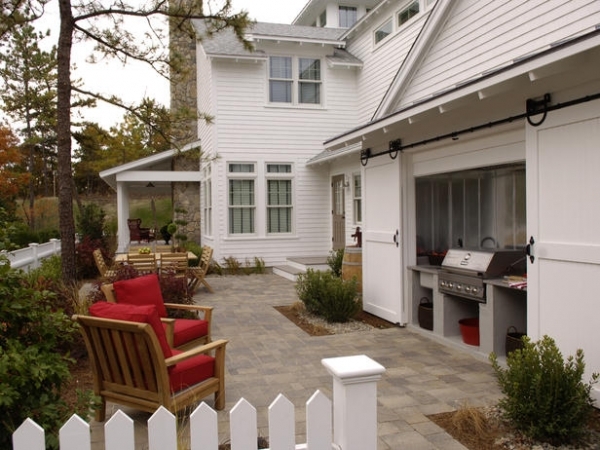 We hope you enjoyed the journey with us through these gorgeous outdoor kitchens. Until next time, happy grilling! What a great resource! Two thumbs up! B O O K M A R K E D! 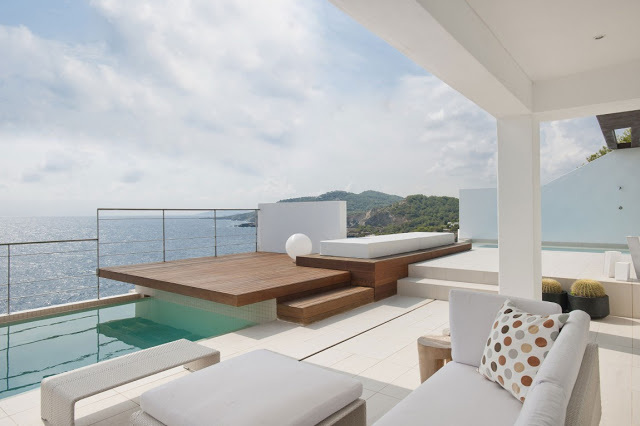 I have to say, it got me thinking a completely practical open air kitchen is circumspectly tucked into its own particular range for simplicity in diverting and eating outside that incorporates a dishwasher for the purpose that you needn't leave the gathering to start clean-up.